Messier 101 (M101, NGC 5457) was discovered by Pierre Méchain on March 27, 1781, and added as one of the last entries in Charles Messier's catalog. It was one of the first "spiral nebula" identified as such, in 1851 by William Parsons, the third Earl of Rosse. Although extended 22 arc minutes on photos and quite bright, only the central region of this galaxy is visible in smaller telescopes, best at low powers. Suggestions of the spiral arms can be glimpsed in telescopes starting from 4 inch as nebulous patches. Several of these patches (i.e., spiral arm fragments) were assigned their own catalog numbers by William Herschel and later observers; according to the NGC and Burnham, there are 9 such numbers, 3 of which go back to Herschel who has found them on April 14, 1789, while the RNGC states that five of the others don't exist (ne); it mentions however that deVaucouleurs has them as knots: NGC 5447 (H III.787), 5449 (ne), 5450 (ne), 5451 (ne), 5453 (ne), 5455, 5458 (ne), 5461 (H III.788), 5462 (H III.789), and 5471. On photographs, however, the Pinwheel Galaxy M101 is revealed as one of the most prominent Grand Design spirals in the sky. While quite symmetric visually and in very short exposures which show only the central region, it is of remarkable unsymmetry, its core being considerably displaced from the center of the disk. Halton Arp has included M101 as No. 26 in his Catalogue of Peculiar Galaxies as a "Spiral with One Heavy Arm". 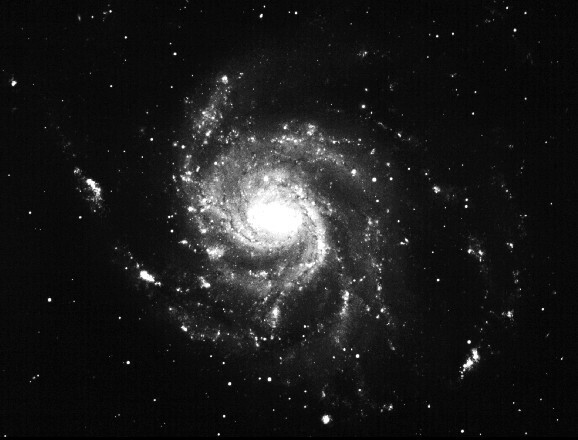 M101 is the brightest of a group of at least 9 galaxies, called the M101 Group. The brightest companions are NGC 5474 (type Sc, 10.85 mag vis) to the SSE and NGC 5585 (Sa, 11.49 mag; Glyn Jones and Burnham misprinted this as 5485) to the NE. Other probable group members are NGC 5204 (Ir, 11.26), NGC 5238 (SB(d)m, 13.35p), NGC 5477 (Ir+, 13.8), UGC 8508 (Ir+, 14.5 p), Holmberg IV (UGC 8837, Ir+, 13.1 p), and UGC 9405. The distance of M101 has been determined by the measurement of Cepheid variables with the Hubble Space Telescope in 1994/95 to be about 24 +/- 2 million light years, by the HST H0 Key Project Team (paper III, 1996). Kenneth Glyn Jones mentions earlier Earth-bound attempts of 1986, when two Cepheids were claimed to have been detected (yielding distance estimates between 20 and 26 million light years). It is also in good agreement with a distance determined from the Planetary Nebula Luminosity function, by Feldmeier, Ciardullo and Jacoby (1996) which is 25.1 +/- 1.6 million light years. According to the recent recalibration of the Cepheid distance scale, the "true" distance of M101 should be closer to a 10 percent higher value (27 million light years). At the new distance from the HST and Hipparcos, it has a linear diameter of over 170,000 light years and is thus among the biggest disk galaxies, and its total apparent visual brightness of 7.9 mag corresponds to an absolute brightness of -21.6 magnitudes, or a luminosity of about 30 billion (3*10^10) times that of our sun. 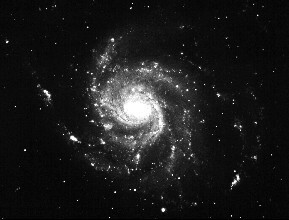 Three supernovae have been discovered in M101: The first one, SN 1909A, appeared on January 26, 1909 and was discovered by Max Wolf; it was of peculiar type and reached mag 12.1 (Glyn Jones reports that the discovery took place in February, and the SN reached only mag 13.5). The second supernova 1951H was of type II, occurred in September 1951 and reached mag 17.5, while the third, SN 1970G, also type II, was discovered on July 30, 1970 by Michael Lovas, and reached mag 11.5. The remnant of Supernova 1970G was later detected in X-ray light and e.g. observed with the Chandra X-ray Observatory (CXO) satellite. According to one of two common views, M102 may have been an erroneous re-observation of M101, which one may doubt though: Alternatively, and perhaps more probably, M102 could be NGC 5866.